International Journal of Research in Health Sciences,2018,6,1,1-5. Department Of Microbiology1, Dayanand Medical College & Hospital, Tagore Nagar, Ludhiana (Punjab) -141001 & District Tuberculosis Officer2, Ludhiana. Microscopic examination of sputum samples for the presence of Acid fast bacilli is still the mainstay for the rapid presumptive diagnosis of pulmonary tuberculosis though it lacks sensitivity. The objective of this study was to compare Ziehl Neelsen (ZN) staining with Auramine fluorochrome staining in the diagnosis of tuberculosis (TB), to improve upon the sensitivity of sputum smear microscopy. All the positive smears by auramine staining were stained with ZN stain, for confirmation. A total 408 out of 2030 samples were smear positive. In the present study the sensitivity, specificity, positive predictive value (PPV) and negative predictive value (NPV) of the auramine staining Vs ZN staining (under RNTCP) was found to be 100 vs. 85.8%, 99.8 vs 100%, 99.5 vs 100% and 100 vs 96.3% respectively. The present study clearly demonstrates the high sensitivity of auramine staining in comparison to ZN staining, though ZN staining is slightly more specific than the auramine staining for demonstration of acid fast bacilli in the direct sputum smear. 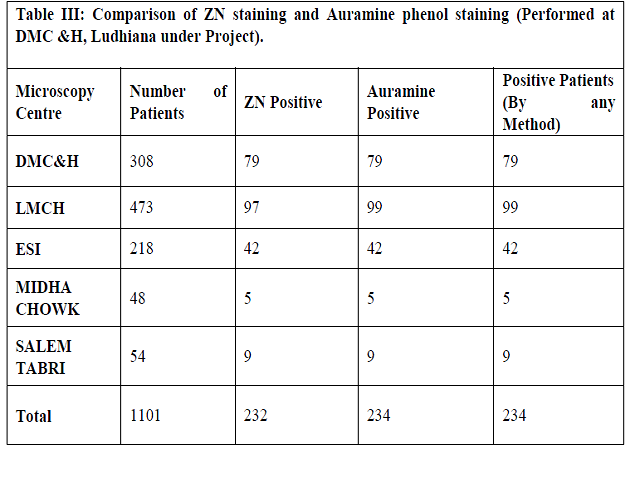 Comparison of ZN staining and Auramine phenol staining (Performed at DMC &H, Ludhiana under Project).